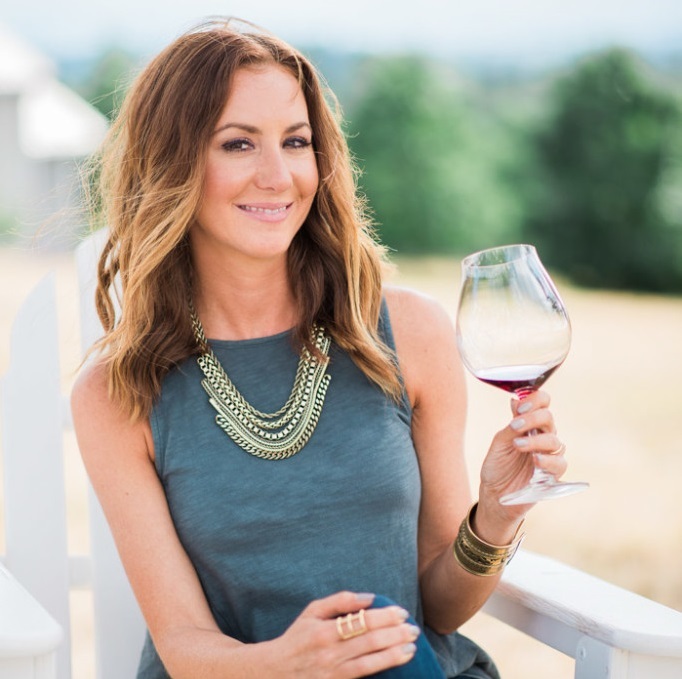 I have a new obsession – And, no, it’s not the newest season of Real Housewives of New York. It’s my Big Green Egg! Have you heard of these things yet? They’re big (or little) ceramic grills that are shaped like an egg (obviously) and are known to hold heat extremely well, add a great flavor to your foods, and are so easy to control the heat on that you can even bake a cake in them, like an oven. Big Green Eggs have a dedicated following of “Egg Heads” and I can now say that I’ve joined that group! We’ve owned a traditional charcoal grill for years now, but I never was really that into cooking on it. It was hard to light, difficult to control the temperature, and the charcoal seemed to always burn off before I was done cooking. So, rather than grilling outside, more often than not I’d just whip out my grill pan and do my “grilling” inside, on the stove. But, with the Big Green Egg, I seriously grilled outside three times the first week I had it. My hair had a constant aroma of campfire-ness. 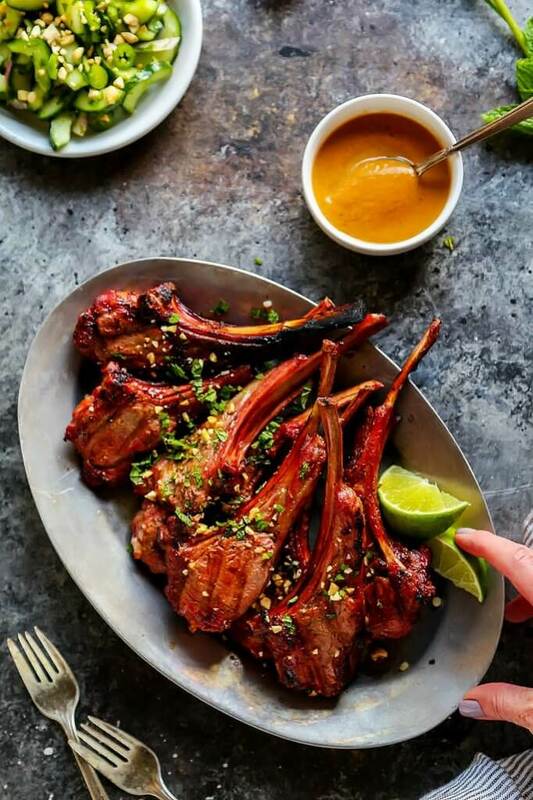 Today I’m going to share with you one of my favorite things that I grilled up – Lamb Chops with Peanut Sauce. I had this beautiful rack of Australian lamb chops in my fridge that was just begging to be cooked on that grill. I contemplated leaving it whole, but in the end, decided to cut it up into individual chops – thinking that it would cook faster that way and that each piece would get a great sear on it. Good decision! And, to add to those smoky chops I prepared a spicy peanut sauce. You know that peanut satay sauce that you find served in Indian restaurants? It’s creamy, spicy, tangy and maybe just a little bit sweet, and it’s typically served with skewers of chicken. I thought it would be a perfect compliment to the lamb. Yep! They work really well together! 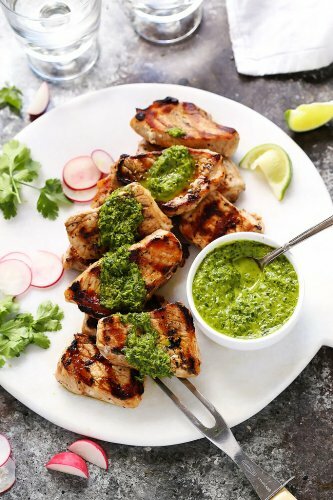 My second time around grilling up the chops, I decided to rub a bit of the sauce onto the chops first, before placing them on the grill – The sweet, nutty sauce caramelizes perfectly on that hot grill and adds even more flavor right from the get go. On the side, I served up a thai-style cucumber sauce topped with chopped peanuts. 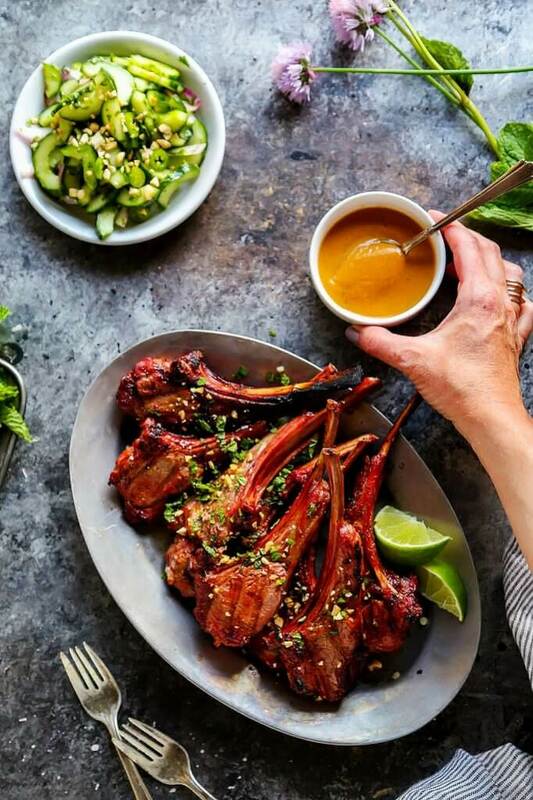 Like the peanut sauce, the cucumber salad is a bit tangy, with a hint of sweetness and some good acidity – It’s the perfect match for those juicy, grilled lamb chops. 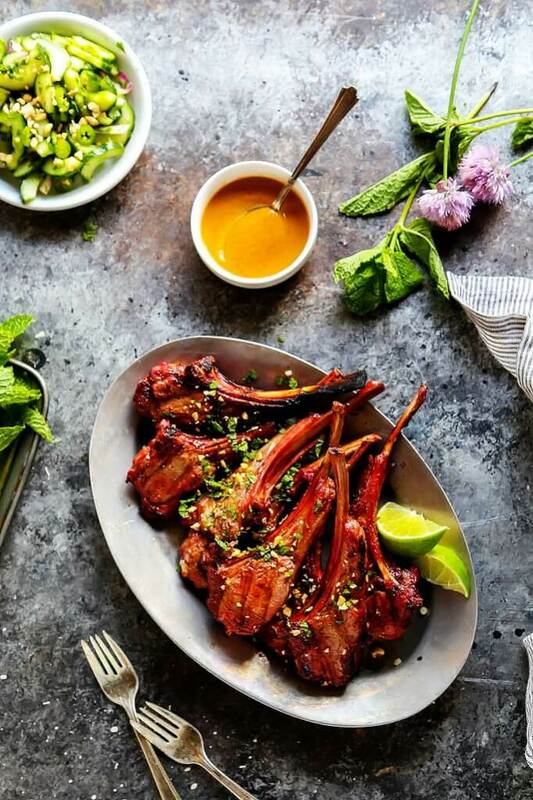 I’d say that these Lamb Chops with Peanut Sauce make the perfect summer meal – They’re quick to prepare and definitely easy to devour! 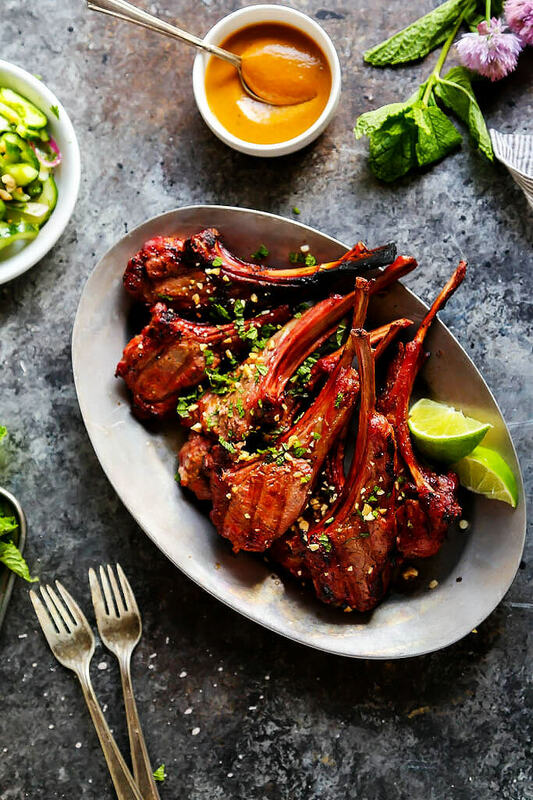 These Lamb Chops with Spicy Peanut Sauce are perfect for your next BBQ. Rich, smoky grilled lamb pairs perfectly with the creamy, tangy Thai-style spicy peanut sauce. It’s a delicious, quick and easy dinner. In a small bowl, whisk the lime juice with the fish sauce, sugar, chiles, garlic and oil. In a large bowl, toss the cucumbers, cilantro, peanuts and onion. Add the dressing and toss to coat. Refrigerate until ready to serve. In a food processor or blender combine all ingredients and process until smooth. Spread 1/4 cup of the paste over the lamb chops and season with salt and pepper. In a saucepan, whisk remaining peanut sauce with 1/4 cup water. Warm the sauce over medium-low heat. 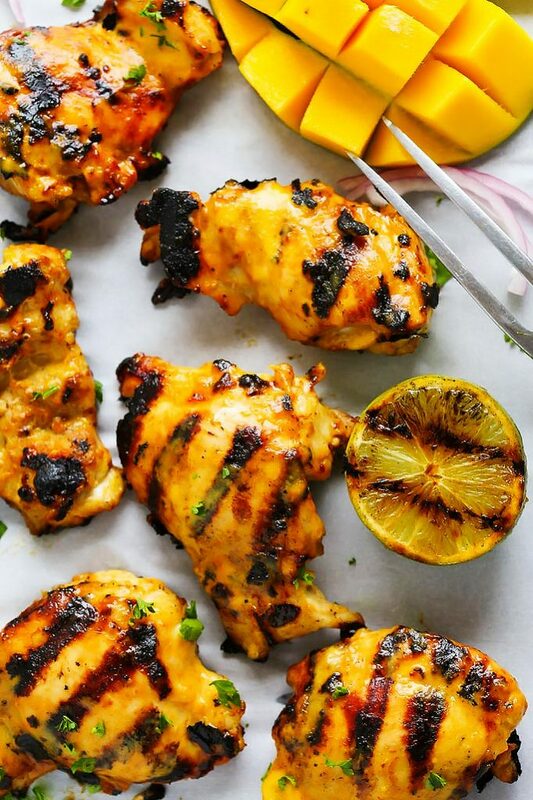 Light a grill or preheat a grill pan to medium-high heat. Grill the chops for 4 minutes per side, or until an instant-read thermometer inserted in the thickest part of a chop registers 125° to 130° for medium-rare. Transfer the chops to a platter. Spoon some warm peanut sauce over the lamb chops and sprinkle with mint and chopped peanuts, if desired. Offer remaining peanut sauce on the side and serve with Cucumber Salad. Malbec with medium body and smooth tannins makes an excellent pairing for the rich lamb chops. Petite Sirah is another great match. With its typical flavors of plum, raspberry, blackberries, and black pepper it lends itself wonderfully to stronger flavored meats, such as lamb. Syrah is another wine that will stand up nicely to these lamb chops and the spices going on in the peanut sauce. This dish looks beautiful! Being Australian, I can’t go past good Aussie lamb! I love the sauce ingredients you used at well! Thanks so much Georgie! Isn’t Australian lamb just the best?! YUM! I love lamb chops!! Oh my gosh! I have heard wonderful things about the Big Green Egg for so long, we can’t pull the trigger since we’re not allowed to use a wood-burning grill (HOA’s) but we would love one! We have been making a cucumber salad on repeat for the last week, it pairs so well with meat-centric dishes as it’s refreshing! I’m going to sign up to win one, we do plan to move someday! 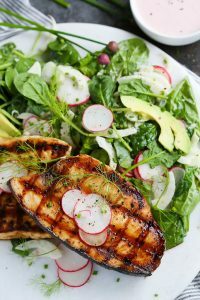 I agree about the cucumber salad Maxene – It’s so refreshing for summer and it goes so well with so many different *main* dishes. Good luck to you!!! I would like to personally congratulate you as your blog Platings & Pairings has been selected by our panelist as one of the Top 200 Food Blogs on the web. I personally give you a high-five and want to thank you for your contribution to this world. This is the most comprehensive list of Top 200 Food Blogs on the internet and I’m honored to have you as part of this! Awww! Thanks so much Sarah!